Chicken Flavour Bouillon Powder Mix. Starch (potato, pea), salt, sugar, flavourings, maltodextrin, chicken fat (3%), yeast extract, chicken (2%), spices (garlic powder, turmeric), onion juice concentrate, sunflower oil, antioxidant (extracts of rosemary). May contain gluten, milk, egg, celery and mustard. 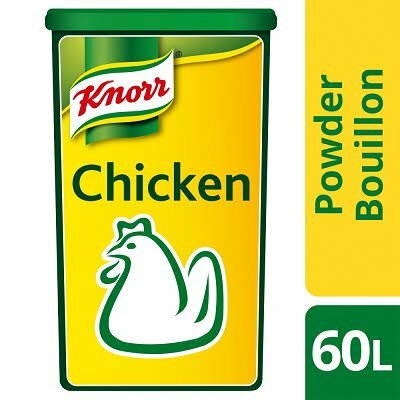 Add Knorr Chicken Bouillon Powder to boiling water and stir until dissolved. 20g per 1 litre of water. Entire pack with 60 litres of water. Keep tub tightly closed in a cool dry place.